The sad news is that our biology works against weight loss. Weight retention once provided an evolutionary advantage (surviving famine) that now is a disadvantage. With the loss of a few pounds, fat cells produce less of a hormone called leptin, which alerts the brain to conserve energy by slowing the metabolism. Adding insult to injury, when the brain senses oncoming starvation, it sends out hunger signals to make us eat more. No wonder we have been trying all sorts of crazy diets for more than a century! Some who choose sensible eating plans may actually succeed in shedding excess weight. However, fad diets based on wacky science rarely result in long-lasting success. 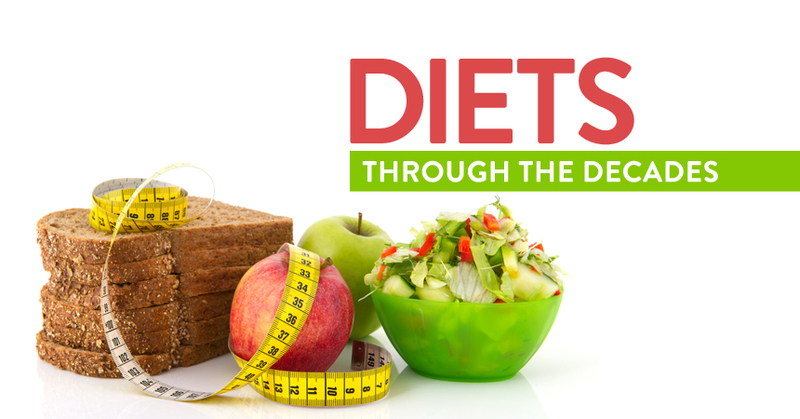 Let's take a look at some of the diet fads through the decades. A preacher from New Jersey, Sylvester Graham (1795-1851), fought back against refined grains by creating the whole-grain Graham cracker. Graham also advocated a vegetarian diet and avoidance of alcohol, but his diet was less about weight loss and more about controlling sexual urges. So, there’s that. “Nature will castigate those who don’t masticate” was the motto of Horace Fletcher, who believed the secret to weight loss was chewing every mouthful of food 32 times, once for each tooth in the mouth. More troubling than questions about whether toothless people should swallow their food whole, or if dentures count as teeth, was stage two of the process. Dieters, while chewing, held their head tilted forward (which likely made dinner conversation difficult), and after 32 chomps, dieters tilted their heads backward. They then spit out any food that did not naturally slide down the throat. Fletcher also advocated chewing liquids. Nicotine, a stimulant, was viewed as an appetite suppressant that also helped with weight loss, but smoking yourself skinny just seems stupid considering what we now know about cigarettes. However, in 1925, long before warnings from the Surgeon General, Lucky Strike came up with its own weight loss shtick with the motto, "Reach for a Lucky instead of a sweet." The Grapefruit (or Hollywood) Diet debuted nearly 80 years ago. The diet consists of lean meat, vegetables and lot of grapefruit, significantly curtailing caloric intake. However, the belief that grapefruit has magical fat-melting properties persists, often based on a 2004 study sponsored by a citrus growers association that claims grapefruit enzymes reduce insulin levels and support weight loss. Grapefruits are full of lots of great nutrients and fiber, but they contain substances called furanocoumarins that block enzymes needed to break down some medications, resulting in sometimes-toxic levels of medication buildup. The lemonade diet, or Master Cleanse, emerged in the 1940s. It promises weight loss and removal of body toxins by drinking only a concoction of lemon juice, cayenne pepper and maple syrup. Really, it's more of a fasting program. Even if the lemonade recipe sounds appealing, consider some of the other plan requirements: nightly laxatives and morning saltwater drinks. Surprisingly, the ’60s spawned one of the more sane dieting options available today: Weight Watchers. But it was also the decade of Metrecal, a meal in a can, and by that, we do not mean a Guinness Stout. Metrecal’s manufacturer, Mead Johnson & Co., went from making baby formula to creating a weight loss product. Soon, canned Metrecal “milkshakes,” cookies and even soups, all with added vitamins and protein, appeared on the market. Other than drink the vile concoction, “all” dieters had to do was stick to a diet of 900 calories a day. Upscale stores marketed Metrecal flasks for “ladies who lunched” and wanted to be discreet about their diet secret. Brownies were not the only baked goods laced with questionable substances in the ’70s. One diet promised weight loss by eating lots of amino acid-laced cookies. Over-the-counter diet pills were another big trend, including Dexatrim (phenylpropanolamine), which was available until 2000 when it was pulled after links to increased stroke risk. This was also the decade of the ominously named “Last Chance” diet, aka the Prolinn Diet, involving yet another vile dieting concoction that consisted of slaughterhouse floor waste (all the stuff not good enough for use in sausages, dog food or even scrapple). Artificial colors and flavors also “enhanced” the mixture. Surprisingly, the drink had no nutritionally redeeming qualities and provided only 400 calories per day. Many who used it became sick – literally – and some even suffered heart attacks while on the diet. Jane Fonda’s aerobic dance workouts came out on both vinyl records and VHS tapes in the 1980s. Women started Jazzercising. Richard Simmons appeared. The '80s also saw the emergence of “scientific” eating methods, including Fit for Life, which banned eating complex carbs and proteins at the same time. Other diets allowed only the consumption of fruits. Prepackaged eating programs such as Jenny Craig also started up in earnest. The Atkins preached low carb, high protein eating for weight loss. The Zone Diet permitted only certain specific combinations of food, in specific ratio amounts. The search for slimming through science continued with the 1996 publication of Eat Right for Your Type, which claimed a person’s blood type determined their optimum diet because the blood type revealed the region where their ancient ancestors lived and thereby the foods best suited to their individual genetic makeup. With the turn of the new century, wackiness reappeared, including Ear Stapling, an acupuncture-based technique for stimulating an appetite suppressing pressure point. It involves placing needles into the inner ear and leaving them there for up to three months. Unfortunately, it also carries a risk of serious infections. The Cotton Ball Diet involves consuming cotton balls to feel fuller. Luckily, options abound with this regime: eat the cotton balls dry or wet (after soaking them in gelatin). Unfortunately, cotton balls are potentially harmful to our digestive system. "Obesity and Overweight." Centers for Disease Control and Prevention. Centers for Disease Control and Prevention, 14 May 2014. Web. 05 Jan. 2015. <http://www.cdc.gov/nchs/fastats/obesity-overweight.htm>.